Instagrammers frequently check the site, often several times a day, and engage with posts at a much higher rate than with other social networks. In short, people who use Instagram LOVE Instagram. To succeed with Instagram, it helps to have a clearly defined strategy, a noticeable visual style, a commitment to regular posts, and an in-depth knowledge of your target audience (subscribers and members). On average, non-profits post to Instagram 1.5 times per day. If your company is creating and sharing great content designed with followers in mind, you will be well received. When used thoughtfully, Instagram is a great way to reach and engage younger volunteers, and advocates. With millions of photos and videos posted daily to Instagram, how will you break through the clutter and reach your audience? Balance Consistency and Quality: Post regularly so followers have content to examine. The images posted need to be compelling in a way that also provides context and understanding of your brand. There is a balance in consistency and quality that must be struck for a successful Instagram effort. Tell a Story: Every post should tell a story about your brand and message. Use the caption to expand on the image – develop the story a visitor may not know just from looking at the picture. 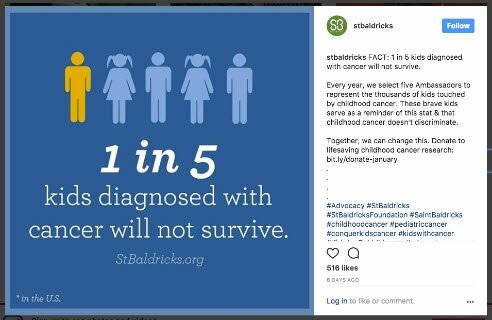 St Baldrick’s Foundation is the self-proclaimed “crazy head-shaving charity,” trying to make a difference for kids with cancer. They use a combination of photos that tell personal stories and graphics that educate and inform. All of the funding that they have received goes to the most promising childhood cancer research. They focus on “passing it on” in every post.